Am I the only one that does not understand the slavish devotion of Pitchfork and every music blogger in America to the good but not great (Clap Your Hands Say Yeah, Arcade Fire, etc.) at the expense of the plethora of truly great music being made overseas at this moment? I recognize that Bloc Party and a few other UK acts have received their fair share of praise in this country, but come on people, let's get with the program. Tomorrow sees the UK release of what is not only one of the best singles of 2005, and one of the great debut singles of recent years, but possibly one of the most infectious two minutes of rock and roll ever recorded. 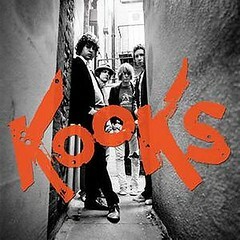 The song is Eddie's Gun by four near-teens from Brighton known as The Kooks. The band is the latest to add its imprint on the British punk-pop revival kickstarted by The Libertines and heralded most recently by The Kaiser Chiefs and Maximo Park. Yet Eddie's Gun also harkens back to the golden age of Supergrass-era britpop. This paean to erectile dysfunction is already receiving airplay on alternative radio stations in the States, including KCRW in LA and WKQX in Chicago. Check out the video (and much more) on the band's website. The band just finished touring with The Dead 60s, and have a smattering of UK headline dates scheduled in July. No US dates yet, but keep your fingers crossed. If you got time , go visit my site, it´s about means health erectile dysfunction. It pretty much covers means health erectile dysfunction and other similar topics available.